My mother just left. And there I was, alone, left with a full bottle of calcium tablets, a bunch of kale and some questions. But before you start thinking that I am going nuts, there's the whole story: My mom who lives in Rio stayed with us for almost 2 weeks and was very assertive on recommending that I should start considering taking daily calcium supplements to avoid bone loss. Her argument was indisputable: She echoed my family doctor's advice. Immediately I found an unopened bottle of calcium with vitamin D -the one I bought after the doctor's office July 2012 - in the pantry and started gobbling three pills a day. Later, I just found an article and another showing new studies, and suggesting that calcium should be better eaten in food, and not just in supplements or milk. Another article, a bit older was celebrating the wonders of kale. Three days after her depart, my worries were immediately transferred to my children's diet. My immediate question was if their daily intake of calcium is satisfactory. After some research, I found out that they are probably not. They don't find it pleasant to drink the recommended 3 to 4 servings of milk - or almond or soy milk- per day, plus some other calcium rich foods. Because they are not so happy about drinking their calcium, I now will add to my daily improvised menu some of the foods that might add what is missing: always some Swiss cheese (a slice has the daily 30% Calcium!) inside a sandwich, more yogurt (check this amazing way of making it at home!) in the house, but mainly adding more calcium loaded non-dairy ingredients to our meals: Kale, spinach, almonds, oranges and broccoli. Thanks mom for the good advice. And here a last minute recipe full of calcium! This is a very loaded calcium food, and for my surprise both boys ate all their portion of gratin last night at dinner. In a flame and oven proof skillet or small casserole melt vegetable spread and add flour, making a paste (roux). Add milk and stir continuously to make the béchamel sauce. Toss kale and spinach, mix, and sprinkle some salt. Cover with Swiss cheese and transfer to a 350 F pre heated oven. Bake for about 15 minutes. Open oven and stir vegetables and béchamel. Bake for 5 minutes more and serve. Yum! 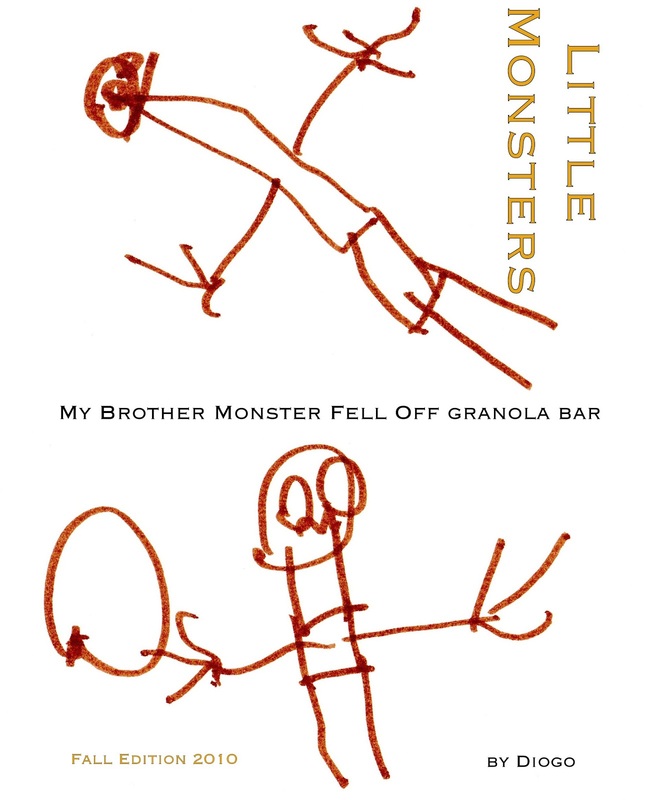 Here's something I realized recently: My two boys, who are portrayed by the youngest in this little design above, are apparently genetically programmed to be skinny. They are always complaining that there's very little time to eat their snack at school. By midmorning they are very hungry, and it looks that they need extra fuel. It's also a time when they would be rather playing than eating. As I tried to use every opportunity to give them something healthy to eat, other than empty nutrition calories, I decided to go with the idea of packing lots of nutrition into one small snack. And it's working. Their level of energy is increasing and I don't have to be concerned about them not eating well. By lunch time they are not so furiously hungry, and are able to enjoy some fruit and a very healthy sandwich packed with protein and vegetables. I use this recipe and I top the bread with pecans or walnuts, and sometimes homemade granola. You can always add more to it. It will even hold some bananas and even more nuts or dry fruits. Besides what the original recipe suggest, I also add some pine nuts for extra nutrition. 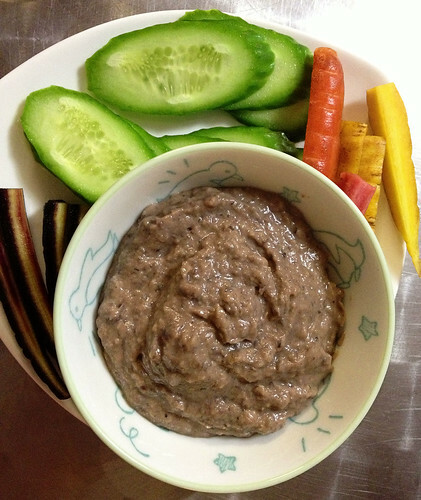 Darienne's recipe is good-looking and it goes well with toasted whole grain bread. 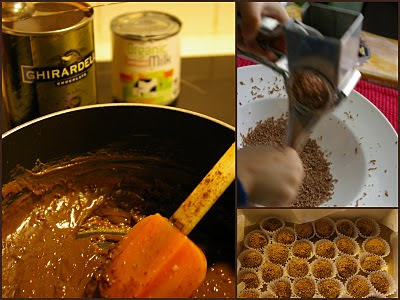 This recipe is foolproof and kids always give ravewww.cook reviews about it when we use it to the Cooking Club. 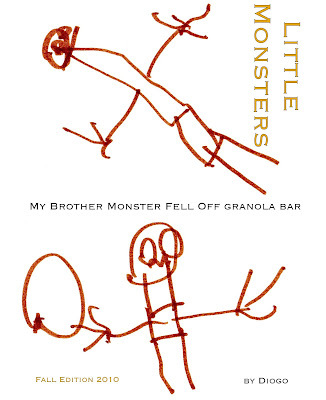 Some kids love the ginger in it. A great recipe by Darienne. Tomorrow is Fat Tuesday, the festive end to the Mardi Gras season, kicking off the start of Lent. 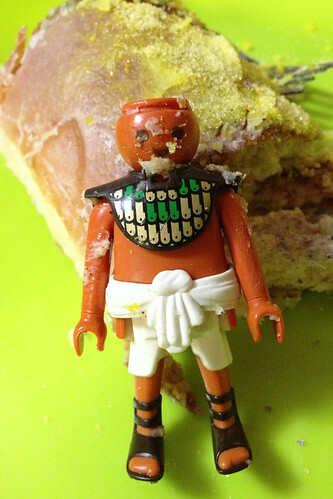 My 8-year-old is our household's Mardi Gras king this year: He found the plastic Egyptian soldier in our king cake! The prize trinket is typically a plastic baby, but I keep forgetting to procure plastic babies — last year the trinket was another Playmobil soldier. In the southeastern U.S. king cakes are a treat throughout the season. Whomever finds the baby or other trinket in their slice is named king or queen for the day, and may have to host the party or bring the cake next year. I confess, I've never had authentic king cake. I've made it twice in two years, and that's the extent of my experience. People have strong opinions about their king cakes, and this is just one version. A delicious version: my cake-averse child inhaled it and my guests wanted leftovers. and decorated with colored sugar. Crunchy topping aside, it's more like a breakfast pastry than what you expect from a cake. Enough so, at least, that I let my kids have seconds for Sunday breakfast. This one takes just over 2 hours to make from start to finish, but most of that is rising time. If you use a mixer to knead the dough, it isn't much work at all. The hardest part is joining the roll of dough into a ring. Mine came out a little wonky on one side, but it doesn't matter. Kids can help with any part of this — except, perhaps, hiding the trinket! The baby (or Egyptian soldier or whatever) goes into the cake after baking. You can slip it in through the bottom of the cake. Do be careful with choking hazards: Our Playmobil figures are a little big, but I don't have to worry about anyone swallowing it. Lego toys, for example, are out of the question. Our cake this year is bright but tame compared with last year's happily lurid version. We went with untinted frosting and let the colored sugar take central stage. Last year, we used colored icing and colored sugar for a much bolder look. 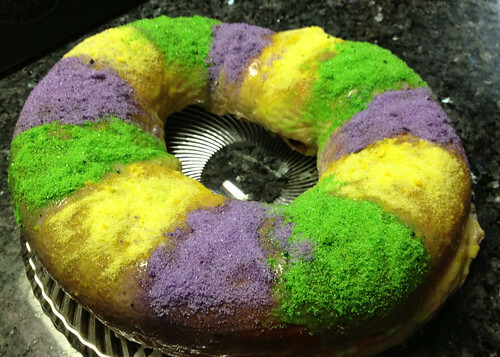 And if you've seen many king cakes, you know bolder is better. If your family isn't familiar with Mardi Gras celebrations, National Geographic has a few G-rated videos (trust me, do not just search for "Mardi Gras New Orleans" on YouTube). We liked this one on Mardi Gras after Hurricane Katrina and Carnival around the world, and this one that explains a little about preparation for Mardi Gras, including king cakes. Adapted from Food.com. If you don't have a baby figurine, substitute another small toy or even something edible, like a large bean or nut. In a small saucepan over low heat, combine butter, sour cream, 3 tablespoons sugar, and salt just until butter melts. Remove from heat and set aside to cool. In a large mixing bowl, combine yeast, 1 teaspoon sugar, and warm water and let sit for 5 minutes. Add the melted butter mixture, the egg, 1/2 cup of flour, and the cinnamon and beat 1-2 minutes until smooth. Gradually stir in the remaining flour. Knead the dough in the mixer or by hand on a floured board until smooth and elastic. Set dough in a lightly oiled bowl, turning to coat, and cover with plastic wrap or a towel. Let rise for an hour, or until doubled in size. While dough rises, make the filling: Combine the cream cheese, egg white, white sugar, salt, and vanilla in a bowl and mix until smooth. In a small bowl, stir together the brown sugar and cinnamon. Punch down dough and roll out to 10- by 28-inch rectangle. 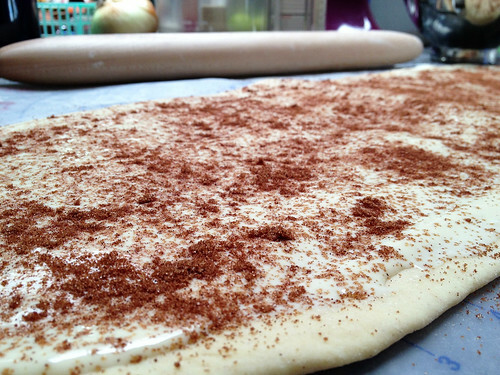 Spread the cream cheese over the dough, and sprinkle with cinnamon brown sugar. Roll up dough starting with the long side to make a long roll and pinch the edges to seal closed. Oil a baking sheet or cover it with parchment paper or silicone mat. 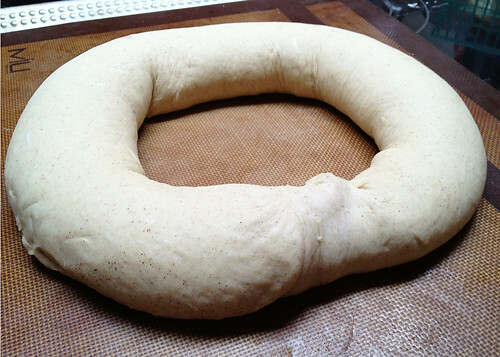 Transfer the roll to the baking sheet and form it into a circle, pinching the short ends together. Cover and let rise 45 minutes. Preheat oven to 375 degrees. After cake has risen, bake it for 15-20 minutes. Check on it after 15 minutes — if it's browning but needs to bake longer, cover it loosely with foil. As cake cools, make the glaze: Stir orange juice into powdered sugar, a spoonful at a time, until you get the consistency you want. Tint the glaze with food coloring if you wish. Spread glaze over cake and sprinkle on colored sugar. Don't forget the baby! Carefully lift up the edge of the cake and insert the figurine into the cake from the bottom. Laissez le bons temps rouler! 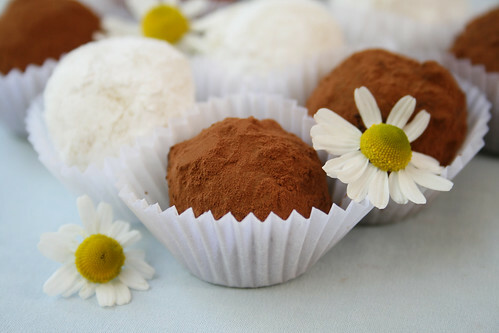 Cake flour: This makes a light, soft cake, and it's easy to make your own substitute. Scoop 2 tablespoons of cornstarch into a measuring cup and then fill with regular flour to make one cup of substitute cake flour — be sure to sift it well. Colored sugar: To make your own, put 1/4 cup of sugar into each of three plastic, zip-top bags. Add a drop or two of food coloring in each bag, seal, and shake vigorously until the color is evenly distributed. If you are looking for an awesome-looking dessert for this Valentine's season (yes, I call it season, as we usually start talking about it least two weeks before the day), here's a good one. You can write your valentine's message on top of it and erase it with the bottom of a spoon, so to re-write your love again. We puréed the fruit compote together, and stirred the condensed milk in turns. The ice cream maker did the rest. Our class was mainly about freezing, as I go more with the science of cooking for the older children, while my other son and his friends in first grade are more into the adventures of cooking. 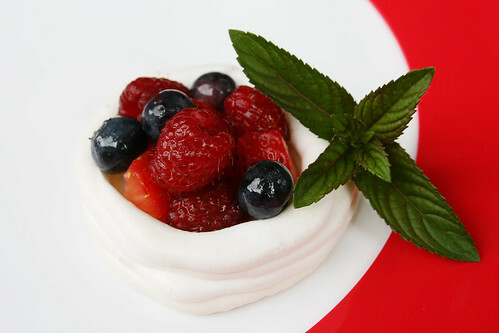 The ideal is to prepare the fruit compote the day before making it in the ice cream maker. Combine the fruits and apple juice in a heavy-bottomed pan and bring to a boil. Simmer for about 30 minutes, half-covered with a lid. Sprinkle gelatin on top and let sit a few minutes, then mix it in and let it cool down. Transfer to the freezer. After about 6 hours, remove and blend it (I used a hand blender) with the condensed milk. Transfer the mixture to an ice cream maker and follow your maker's indicated time for a creamy and firm texture. Mine took about 25 minutes. Another option is to transfer the mix to fancy cups and freeze it for up to 2 hours, enough to be able to write your message on it! Vote for us in the Parents magazine awards! We’re honored and delighted today to share some big news: Cook Play Explore has been nominated as one of the best blogs of the year at Parents magazine! Be sure to check out all the nominees this year. I've discovered some fantastic blogs through these awards in the past (that's how I found the charming Made by Joel and the delicious Annie's Eats). We are especially happy with our category. 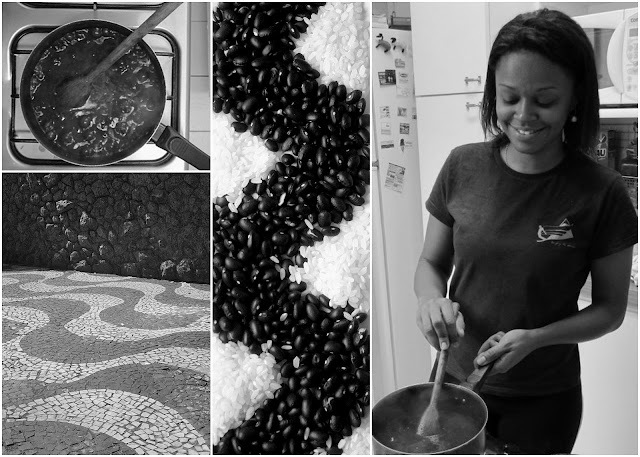 When new acquaintances ask about the blog, Anna and I usually fall back on the simplest explanation: It’s about preparing and enjoying food with the whole family. But we really are about more than that, and we’re so glad we resonate with readers as a motivational resource. We aren’t — and never will be! — super moms, but we’re always trying to find ways to do a little better. We write about our own goals: to coax children to try new tastes, to serve healthier fare, to preserve our sanity in the kitchen, to seize opportunities to turn ordinary dishes into something extraordinary, and especially to nurture playfulness in the kitchen. Thanks for joining us!